Shown in the upper right is a close-up of the CRV-46246-A receiver. Note the orange Army Signal Corps stamp on the front panel. 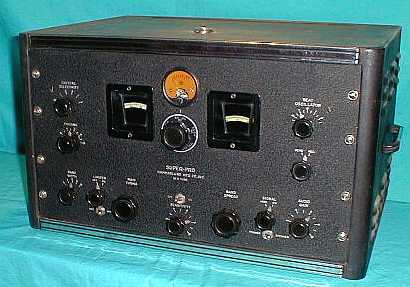 Normally, the CRV-46246-A was a Diversity Receiver for the U.S. Navy RDM Triple Diversity Receiver - note that the metal ID plate does have "NAVY DEPARTMENT - BUREAU OF SHIPS" on the tag. The non-standard RCA ID plate was created by John to fill the space where a meter had been. 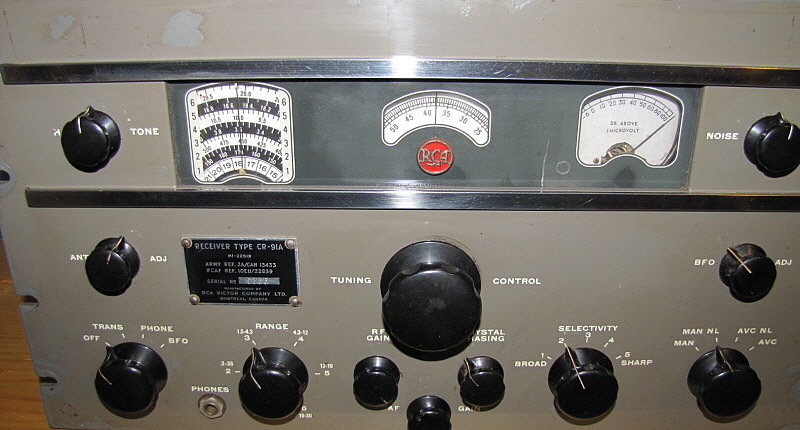 Shown in the lower right is the CR-88A receiver with an original type Carrier Level meter installed. In the mid-1950s, the Chinese started building copies of the RCA CR-88A (possibly the SC-88.) These receivers were designated as WS-430 and while they are very close copies, they are not what one could call replicas. Instead the Chinese used Russian tubes, slightly changed the locations of some of the components and ultimately replaced some of the tubes with miniature versions. These later copies were designated as the WS-430II. These receivers were used in airports and other communications locations in China. Note in the photograph that this receiver is equipped with a Diversity IF Gain control which implies that this receiver may have been used in a diversity system. With the top of the chassis mounted crystal for the Crystal Filter and the Diversity IF Gain control it is possible that the SC-88 was copied. 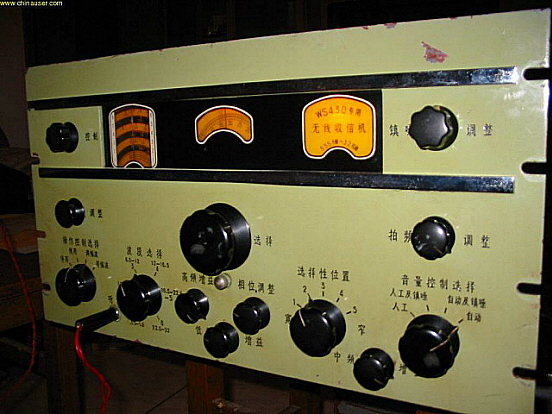 Today, the WS-430 series doesn't seem to be very popular with Chinese hams or collectors although this one was pictured on a website of Chinese equipment. Apparently, most Chinese hams prefer new, modern equipment and are not fans of receivers that were copies of USA designs. Thanks to WA6OPE and WB6NVH for the WS-430 info. This nice condition CR-88A is located in South Africa and is owned by Jacques Scholtz, ZS6JPS. The receiver's serial number is 001700. It has an original, RCA umber '88 series cabinet although the two screw covers are missing. CR-88A receivers were typically for triple diversity receivers but many were sold as "stand alone" receivers by RCA. The CR-88A is the post-WWII replacement for the AR-88F. This very nice CR-88 is owned by K5UJ, Robert Akinson. It was purchased at a Ft. Wayne, IN hamfest last November. The receiver had been fully rebuilt and also featured the "hard to find" Carrier Level meter (all CR-88 receivers were originally equipped with CL meters but sometimes they've been removed for some reason.) Robert uses the CR-88 with a pair of 8 Z ohm 12" speakers in cabinets and also utilizes a TR switch with the receiver when paired with a transmitter. This CR-88 is sn 1695. Mike just finished his restoration of CR-88 sn 001341 recently. The receiver has had all of the tub caps replaced and the Micamold caps were also replaced. All out-of-tolerance resistors were replaced. Mike also sweep-aligned the CR-88 for attaining the best audio response from the receiver. Note that this CR-88 has the original carrier level meter. Mike came up with an easy non-destructive way to mute the receiver. All CR-88 receiver panels are punched for the Diversity IF Gain control but have a snap-hole-plug installed instead. Mike removed the snap-plug and installed a two position rotary switch with RCA knob. The switch has the RF Gain control ground return routed to one terminal and ground on the other terminal thus providing a front panel mute function. By switching to the "non grounded" position (or "mute") the RF Gain pot is then not going thru the 6.8K resistor to ground so the RF gain line goes to the high side of the bias supply which simulates turning the RF Gain maximum CCW. Mike also mentioned that a line from the gain control side of the switch could be run to the AVC terminal (with the AVC wire unsoldered and its end insulated with shrink tubing) on the rear of the chassis thus providing a remote mute function. So, either local or remote muting is provided with no destructive mods. A really easy solution to the common problem on all of the '88 receivers and their lack of a remote standby that doesn't involve the soaring B+ when TRANS is used. More details on these remote muting mods below in "Using the AR-88 as a Ham Station Receiver." What is unusual about Chris' CR-91A is that it was "reconditioned" by a private electronics firm in Canada, "Canadian Aviation Electronics LTD" with a date on the tag of FEB/5/1953. Obvious in the photograph are the white dials and meter scale. These pieces were manufactured by Canadian Aviation Electronics as part of the rebuild to replace damaged original yellow dials. The metal tag on the front panel is the standard RCA-Victor Montreal data plate. Chris is planning to fully restore the electronics of the unique CR-91A and incorporate it into a relay rack for use with a vintage transmitter. The last version of the RCA '88s, the CR-88B. Few were built and today it is an extremely rare receiver. Condition doesn't get much better than this example owned by Billy, N6YW. Billy also has the original matching loudspeaker for this rare receiver. Successful diversity operation requires multiple spaced antennas and multiple receivers - not something that every operator has available. Here's how it's done if you have the physical space and the receivers. Let's take antennas first. The DR-89/RDM manuals state that the required antenna spacing is 1000 feet oriented in a triangle. However, this was military/commercial set-ups and provided absolutely the best diversity effect for nearly all frequencies in the MF and HF part of the spectrum. Usable diversity effect can be achieved with antenna spacing at around one wavelength at the received frequency, sometimes even less. If space is really tight, one antenna can be a vertical and the other a dipole, in other words, one vertically polarized and one horizontally polarized antenna - assuming dual diversity. For most frequencies in the HF region, 100 feet of separation will give usable diversity effect most of the time. It's a little close for 80 meters so if you can get greater spacing then try for at least one wavelength. Next are the particular AR-88 receivers that you are going to use. Your AR-88 receivers should be the actual diversity models that were used in the DR-89, RDM or OA-58A/FRC receivers. That way you'll have the separated Diode Load and Diode Return lines and you'll have the AVC line available. Additionally, only the diversity receivers have several resistor changes in the IF section for better diversity effect. Although all AR-88 versions provide a terminal to access the AVC line, only the true diversity versions will provide terminals to allow "diode-OR'ing" of the second detectors of each receiver to achieve true diversity operation. When receivers designed for diversity operation are used, you'll find that the second detector output is brought out to terminals on the rear of the receiver marked "Diode Load" and Diode Return." When operating two or more receivers in diversity, each of the receiver's detector outputs, the Diode Load, are connected together, in other words, "diode-OR'd." This then allows the receiver with the strongest signal to dominate the other receivers. As the signals fade because of multipath phase shifting on any of the antennas, whichever receiver has the strongest signal will dominate the Diode Load line. The Diode Return line was provided to route the signal on to the receiver's audio output circuits. Only one receiver needs to provide audio output for the diversity system. The remaining receiver's audio circuits are generally left no connected to the Diode Return. In order to keep the diversity system stable it is necessary to have feedback for control and this is accomplished with the AVC line. All AR-88 versions of the receivers will provide an output for the AVC line at the rear of the receiver. For diversity operation, all of the receiver's AVC line terminals need to be connected together. >>> >>> In theory, you would only need one receiver out of the two or three used in Diversity to provide the audio output. The Diode Load would be connected to the Diode Return on that receiver only. This would seem to make tuning all of the receivers to the same signal difficult since you would need some way to know what signal is tuned in on all of the receivers. It's not really necessary to activate the other receiver's audio output in order to hear or measure their response to the desired signal. The easiest way to accomplish this is to designate one receiver as Master and the other receiver as Slave. The Master receiver has the speaker connected and has the Diode Load and Diode Return connected together while the Slave doesn't. Only the Diode Load terminals are connected together from each receiver. To tune in a signal, first disable the Slave receiver by turning its RF Gain to minimum. Now only the Master receiver is operating. Tune in the desired signal on the Master. Now, reduce the Master receiver's RF Gain to minimum and increase the Slave receiver's RF Gain to maximum and tune in the desired signal on the Slave receiver. What you hear out of the speaker is the Slave receiver even though the speaker is connected to the Master receiver. Now return the Master receiver's RF Gain to maximum. You'll have to balance the two receivers with the IF Gain controls for equal response to the signal. Since each antenna is slightly different one receiver could overdrive the system with too much gain. The balancing with the IF gain control will allow each receiver to respond to the signals equally. If you have three receivers in this diversity arrangement, you'll have to designate the third one as Slave 2 and do the tuning and balancing accordingly. It's sometimes difficult to tell if the system is balanced without carrier level meters. You can usually hear if one receiver is dominating the AVC line though and just reduce its IF gain until the signals seem balanced. Be sure to connect 4.7 ohm resistors across the speaker terminals on the Slave receivers and keep their Audio Gain controls at minimum. You'll only use the audio section of the Master receiver. Now in the original DR-89 diversity rack, the operator had the Monitoring Unit where each receiver's Diode Load current could be actually measured. However, most amateurs don't have all the pieces to the diversity rack. An elaborate set-up could use three current meters (0-300uA) in the Diode Load to Diode Return line to act as a more accurate reference for balancing. In the professional set-ups, much of the copy was done by machines that required absolutely perfect signals but since our use is only for listening pleasure, balancing by ear is certainly close enough. As the receivers become equal in response (balanced,) the diversity signal will become more stable and fading will disappear. Dual diversity with properly spaced antennas will reduce fading about 90% while triple diversity with properly spaced antennas will reduce fading by 99%. I really can't title this section "'The Competition" since the AR-88 really didn't have any - given its unique history. However, for comparison I've selected three of the best performing receivers of the 1940s that, in addition to having a history of military use in WWII, also were popular ham receivers - both before the war and after. 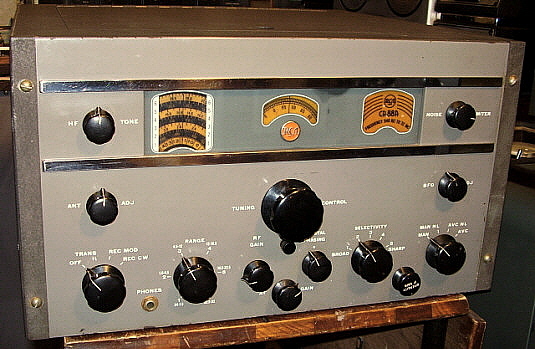 Hammarlund SP-200 Series 'Super-Pro' - The SP-200 was a popular commercial receiver before WWII but was generally too expensive for many hams to purchase at that time. 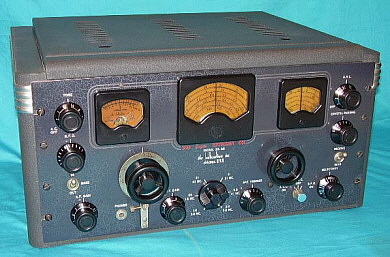 By the 1950s, the SP-200 military receivers, BC-779, BC-1004 and BC-794 were becoming available through the surplus market and for many hams this was their first exposure to this great receiver. 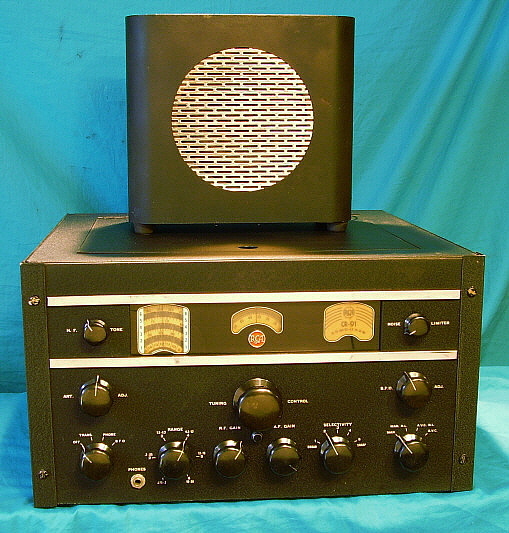 Certainly, performance and quality build reputation was what motivated the Signal Corps to have thousands of SP-200 receivers built for their use during WWII. Many of the surviving surplus examples are victims of years of use/abuse and now require extensive restoration to achieve their true performance capabilities. The SP-200 has double-preselection on all bands, an accurate 0.5% dial readout, a unique bandswitching system that uses a cam-operated plunging "knife-type" switch contacts and probably its most famous attribute - its variable-coupled IF selectivity. Also famous - the 'Super-Pro' 14 watt P-P audio. As for advantages over the AR-88, the Super-Pro has the following - a higher power and certainly to some ears better quality audio reproduction, bandspread tuning, infinitely adjustable selectivity, an S-meter and an easy to use Send-Receive/Remote Stand-by set-up. Disadvantages are - actual tuning range is rather limited on any individual model, antenna input is not adjustable, requires a separate power supply, the audio output is 600 ohm Z only (other than Hi Z phones) and sensitivity falls off rapidly above 20mc on the SX (BC-794) versions. Also, since the SP-200 was really designed to be on continuously, it takes a very long time to stabilize - drift lasts for at least an hour, sometimes longer. High front-end noise was also a common complaint with the Super-Pro receiver but a matched antenna would generally help out this particular issue. On the weight side of things, the receiver generally weights about 60 lbs in the cabinet and the power supply weighs about 50 lbs depending on whether its the heavy-duty military version (~60 lbs) or the standard Hammarlund type (~45lbs.) Below 20mc, the SP-200 will certainly equal the AR-88 in performance with a positive edge given to the Super-Pro on the audio performance and the infinitely adjustable selectivity. When it comes to reliability though, the Super-Pro used C-D TIGER paper capacitors which were a constant source of problems. Of course, the AR-88 used Micamolds - probably the worst caps ever made - so both receivers have questionable quality on the capacitors used. National HRO Senior - As with the SP-200, the HRO was available long before WWII and already had a large group of enthusiastic users - hams. Great Britain was sending over individuals before Lend-Lease to buy HROs to take back to England for intercept work. The HRO has double preselection on all coil sets - that's right! - you have to change coil sets to change the tuning range. Usually, four coils sets gave the user about 1.7mc to 30mc coverage. Most military users got the complete set of nine coils for coverage from 50kc to 400kc and 500kc up to 30mc. Storage of the unused coil sets was a problem. Then there was the micrometer dial - the readout had to be compared to a graph to determine where you were tuned. Also, a separate power supply was required. Why did a receiver that used plug-in coils, indirect readout and had a separate power supply rate so high with military users? Because the HRO had absolutely the quietest front-end with the best sensitivity available. The mechanical tuning was fabulously smooth and accurate (given that charts and graphs were involved.) For finding those weak signals, the HRO couldn't be beat. Audio is from a single-ended 2A5 or 42 depending on the vintage and while not in the Super-Pro league, it is respectable and sounds great with a good matched speaker. The HRO has an easy to set-up Send-Receive/Remote Stand-by function. Disadvantages are: numerous accessories required, stability takes about an hour to achieve, no selectivity control other than the crystal filter and no direct frequency readout. While the chassis is well constructed, the cabinet is only held together with a few sheet-metal screws. Weight-wise there's no comparison - the HRO receiver only weighs around 30 lbs and the power supply about 10 lbs. Additionally, the receiver is very small when compared to most of its contemporaries. Compared to the AR-88, the HRO has superior sensitivity, with the exception of coil set A (10M.) If used in the bandspread mode (only available on the non-WWII versions and only on coils sets A, B, C and D) the tuning resolution is unbeatable. Reliability of the HRO is quite high since all versions built after 1936 used Sprague capacitors and Centralab resistors. 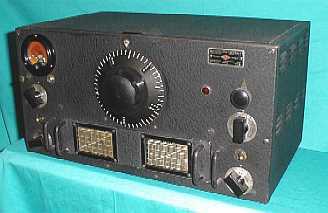 Hallicrafters SX-28 - The SX-28 was also available just before WWII being introduced in August 1940. By early 1942, the SX-28 was becoming very popular with the Signal Corps and, in addition to the standard configuration, the SC also had the heavy-duty version, AN/GRR-2, and the airborne version R-45/ARR-7 built. The SX-28 has double-preselection above 3mc and six positions of selectivity but it's ham band calibrated bandspread is unique to all of the receivers mentioned here. That the military had any use for the ham band calibration is doubtful but it was present on all versions except the R-45/ARR-7. SX-28 advantages are - its famous audio reproduction which used two 6V6 tubes providing 8 watts of P-P audio with great bass response, the Lamb Noise Silencer was a tuned noise blanker that worked great - even on CW, a calibrated and fairly accurate bandspread tuning, an Antenna Trimmer, a built-in power supply and an easy Send-Receive/Remote Stand-by set-up. Disadvantages are few but the audio output only provides 500 and 5000 ohm Z outputs that almost dictates the use of a Hallicrafters speaker, usually the PM-23. Additionally, drift stability takes at least 30 minutes to achieve, usually longer. Also, the build quality is certainly below that of the AR-88 or the Super-Pro with lots of self-tapping sheet metal screws used in the construction. Additionally, like nearly all of 1940s receivers, the SX-28's sensitivity drops off dramatically above 20mc. Weight is considerable because of the built-in power supply and usually runs the scale up to 75 lbs when in the cabinet. The SX-28 is certainly an equal performer to the AR-88 (below 20mc) and, like the AR-88, only a speaker is required as an accessory. The audio is more powerful and, to most ears, more impressive than the AR-88's. Reliability of the SX-28 doesn't compare to the AR-88. This review should be considered for "rebuilt and aligned" AR-88 Series Receivers. Original condition receivers, while they may seem to operate quite well, are never functioning at their design limits. Best performance results will be experienced with fully rebuilt and aligned receivers used with good quality antenna systems. The AR-88 series receivers are examples of 1940s receiver designs that will perform so well you'll think it was designed in the 1950s or 1960s. They were actively used by RCA and RMCA up into the 1970s when most 1940 radio designs had long since retired. Highly sensitive all the way up to 10 meters with five steps of selectivity to cope with crowded bands, an effective noise limiter and, of course, that fabulous audio that reproduces those low bass tones with no distortion. The AR-88 high frequency sensitivity is renown and was achieved by using polystyrene coil forms in the higher frequency bands - and this in a day when most people had never heard of polystyrene plastic. Full sensitivity is available all the way up to 10 meters. Hearing stations was really never a problem with the AR-88. Selectivity is a little problematic because the early AR-88 design assumed that all you wanted the Crystal Filter for was to narrow the IF passband. It does that very well but, as many AM ham ops know, a good crystal filter can also be used to eliminate heterodynes. CW ops know that a good Crystal Filter can enhance certain audio tones making CW easy to copy through QRM and QRN. RCA decided to change the AR-88 design after WWII and moved the Phasing Control to the front panel. If you want to have the advantage of a Crystal Filter Phasing control easily accessible on the front panel, you'll have to find the CR-88 version or other late versions of the receiver. Dial accuracy is where almost all vintage receivers find their detractors and the AR-88 is no exception. The tuning dial is "1940s" accurate but since wide slices of the spectrum are covered in each band, the resolution of the dial is necessarily vague. The ability to have 1.0kc readout (or better) on a receiver has been around since the late 1940s but many of today's hams have never been exposed to how frequency accuracy was achieved without a Collins-type readout (or, a modern digital readout.) Before the digital world, every commercial and military station had heterodyne frequency meters and if it became necessary to know exactly where the receiver was tuned, these instruments allowed the operator to set the receiver frequency to better than 1.0kc accuracy. The logging scale then allowed the operator to return to that exact frequency once it was known. SSB signals are easy to copy on the AR-88 and you don't need to do any modifications either. Simply turn off the AVC, increase the AF gain to near maximum and then reduce the RF gain by about 25%. Tune in an SSB signal with the receiver in REC CW (BFO on) until the voice sounds normal but overdriven. Then slowly reduce the RF gain until the audio clears up. Usually, the RF gain is about 60% or so on most SSB signals but it depends on signal level and the band in use. >>> >>> Since a VT-150 tube regulates the +150vdc voltage (which is used for the LO and BFO plates besides the receiver screen supply) the AR-88 is very stable. Drift is practically non-existent after about a 10 minute warm-up. You can listen to the West Coast 40M SSB Swap Net (or your local Amateur HF SSB Swap Net) without getting up to retune every five minutes. For CW, the stability makes this mode easy to enjoy when using the AR-88 as the receiver. AM is where the AR-88 really becomes a "great" receiver. Audio reproduction is wide range in SELECTIVITY BROAD POS 1 and the receiver will produce undistorted bass notes like no other "communications receiver" can. 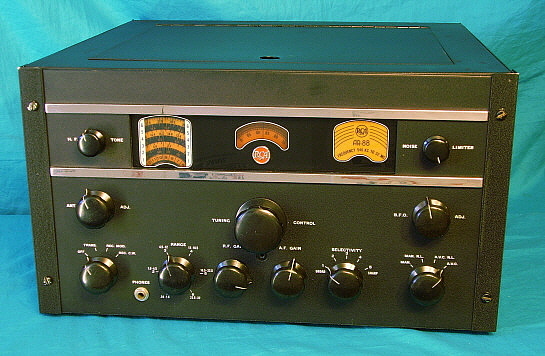 Vintage AM ham stations sound great but the ham stations that run retired AM Broadcast transmitters sound incredible on the AR-88. If the AM signals are weak, better IF gain is available in POS 2. When QRM becomes a problem, POS 3, POS 4 or, in severe cases, POS 5 can be used to eliminate the problem. If you have the later versions of the receiver with the CRYSTAL PHASING on the front panel you can effectively eliminate SSB QRM with in the MOD (AM) position. The antenna connections are originally terminal strips but it is easy to utilize coax as the feed line by connecting the shield to the ground-A2 terminals and the center conductor to A1. Spade lugs can be crimped or soldered to the coax shield and center conductor for easy connection to the terminals. This provides an unbalanced input to the AR-88 which is the normal output from a standard antenna coupler that would be used with a typical ham antenna. The receiver performance will be at its best with a matched antenna. Using the correct impedance loud speaker will provide very loud audio output from the 2.5 ohm Z terminals. The original speaker is hard to find but any speaker from 3.2 to 4.0 ohms Z will provide very loud audio output. Speakers with 8 ohms nominal impedance require that the AF gain be advanced substantially. Try to use the lower Z speakers for best audio performance. The AR-88 AF gain control is normally advanced about 25% to 40% for normal listening when in the AVC-controlled AM mode and driving the correct speaker impedance. You can also utilize the 600 ohm Z "line" audio output with a matching transformer but I have always found the 600 ohm Z audio to not be quite as clear sounding as the 2.5 ohms Z output. If you do use the 600 ohm line for the audio output be sure to install a 4 ohm 2W resistor on the 2.5 ohm Z output terminals for a load. Using a good quality, 3.2 ohm Z speaker will provide excellent audio but don't be fooled into thinking that a modern 4 or 8 ohm Z stereo speaker box will sound really great - they usually don't. The reason is they aren't very efficient with only 2.5 watts of drive power available from the AR-88. The old style, fairly stiff suspension, 12" PM 4 ohm Z speaker mounted in a large box with bass reflex port will sound best. If you can find a large speaker with a 3.2 ohm Z voice coil, the performance will be even better since you won't have the AF gain quite so advanced as with the higher Z speakers. The original MI-8303D speaker is only an 8" speaker but it is very good for most communications-type audio. The larger speakers with good enclosures will show-off the AR-88 audio best. Lastly, there is the weight issue. There's no doubt that the AR-88 is a very heavy receiver. In the cabinet, with all of the shields installed, it will weigh just over 100 pounds. This makes moving the receiver around a strenuous effort. I find that it is helpful to remove the receiver from the cabinet when moving. This will lighten the load by around 10 to 15 pounds. Also, the use of a roll cart is a tremendous help when moving the receiver from the work bench to another room - like the ham shack. Utilizing the AR-88 receiver or one of its variants in a ham station will require some serious thought on how to accomplish receiver "stand-by." This is because all versions of the receiver are designed to not use the station transmitter to actuate a remote standby condition in the receiver. If your AR-88 is a "stand-alone" version with the "TRANS RELAY" terminals, you'll find that RCA designed the receiver to provide the Send-Receive function (closure of switch contacts) with the operation of the function switch to the "TRANS" position. This function was meant to operate the station Send-Receive relay but, of course, having the receiver control the Send-Receive function is opposite of the normal ham station operation. While you could have the "TRANS" position operate a transmitter's remote push-to-talk line with the receiver, not all transmitters provide a remote PTT line. If you operate CW only, then the easiest solution is to use an electronic T-R switch to protect the receiver's input. These devices were originally developed for "break-in" keying which actually allowed you to keep the receiver operating while you were transmitting CW. You could actually hear some signals in between your sending (unless you sent fast CW in which case you had to pause between sentences for "break-in" stations.) The electronic T-R switch can be used on AM but it has so many disadvantages that most of the potential users become frustrated with the incessant feedback and end up using the "TRANS" position for full muting. The following simple modification will provide the AM operator an easy way to remotely mute his AR-88 receiver. AR-88 Muting Mod - All versions of the AR-88 have an AVC terminal on the rear apron that was for diversity operation. This terminal is almost never used. Also, in the diversity receivers, there are the DIODE LOAD and DIODE RETURN terminals that are always externally shorted by a jumper unless you are going to operate two or three receivers in diversity. Again the DIODE LOAD/DIODE RETURN terminals are almost never used. So, if you have a standard receiver, e.g. AR-88D, AR-88LF, CR-91 or CR-88, this mod will be incorporated using the AVC terminal. If you have the diversity versions, e.g. AR-88F, CR-88A or SC-88, this mod will be incorporated on the DIODE LOAD/DIODE RETURN terminals. What the mod is going to do is to relocate the RF Gain control ground-side terminal to either the rear AVC terminal or to the DIODE LOAD/DIODE RETURN terminals. Since the RF Gain controls the bias voltage, if we remove the ground connection at the potentiometer, the RF Gain bias will go to maximum negative voltage thus simulating turning the RF Gain all the way down. The RF Gain control chassis ground connection is through a 6.8K ohm resistor that can actually be any value from 5.6K to 6.8K depending on which model AR-88 you have. The 6.8K resistor prevents taking the bias voltage directly to chassis ground if the RF gain control was at maximum gain (minimum resistance.) When disconnected from chassis for muting, it doesn't matter where in the circuit the 6.8K resistor is BUT for receiving the 6.8K resistor must be between the RF Gain pot and chassis. It will be noted that the AVC terminal mod disconnects the 6.8K from chassis while the DIODE LOAD/DIODE RETURN mod disconnects the pot from the 6.8K resistor that always has one end connected to chassis. Both connections function identically for muting. >>> AVC Terminal Use - Unsolder the wire connected to the AVC terminal and insulate its end with shrink tubing. Unsolder the chassis end of the RF Gain control 6.8K resistor. Mount a tie strip near the RF Gain control and solder the end of the 6.8K to the insulated tie point. Run a 24" long wire from the tie point connected 6.8K resistor back along the wire harness down the center of the chassis to the AVC terminal. Trim the wire for correct physical length and solder its end to the AVC terminal. Externally connect one wire of a two-conductor shielded cable (along with the shield) to the receiver chassis-ground using the antenna-ground screw terminal. Connect the other cable wire to the AVC screw terminal. You can now remotely short these two wires together for normal operation of the RF Gain control or open the connection for muting. DIODE LOAD/DIODE RETURN Terminals Use - Remove the 6.8K resistor from the RF Gain pot and chassis. Unsolder the DIODE LOAD and DIODE RETURN wires from the rear terminal strip and solder these two wires together. Use shrink tubing to cover the solder joint. Now install a solder lug under the nut that mounts the terminal strip. Solder the 6.8K resistor from the DIODE RETURN terminal to the solder lug. Next solder an 24" long wire to the DIODE LOAD terminal. Route the other end of the wire along the wiring harness up the center of the chassis to the front panel. Trim the length of the wire as needed. Solder the end of this wire to the RF Gain pot terminal where the 6.8K resistor was connected. This completes the mute mod. You can now remotely short the DIODE LOAD and DIODE RETURN terminals for normal operation of the RF Gain control or remotely open these terminals for muting. NOTE: The basis for this simple mod came from W7MS. Be sure to take a look at "Collector's Gallery" above and specifically the W7MS CR-88 receiver. Mike added a rotary switch in the IF Gain pot hole that provides an easy way to "mute" the receiver either locally (from the front panel) or remotely (repurposing the AVC terminal on the rear chassis.) Thanks to Mike for the really useful and really non-invasive and easily reversible mod. UPDATE: I've installed this muting mod on my CR-88A receiver using the DIODE LOAD and DIODE RETURN terminals as described above. I have the CR-88A set up with a Collins 32V-2 transmitter running just over 100 watts output. I'm using the auxiliary contacts on a Dow-Key T-R relay with shielded cable (about two feet long) from the receiver to the transmitter. Operation on AM is a real pleasure now. No more manually switching to the TRANS position for standby and no more feedback when I forget to switch. This easy to install (and non-destructive) muting mod has made the CR-88A really enjoyable to use as the station receiver. One note, if you turn up the receiver Audio Gain to maximum you will slightly hear the audio modulation of your transmission but it's far below a level that causes feedback. At normal listening levels (Audio Gain about 25%) nothing will be heard in the loudspeaker when the receiver is muted. During the daylight hours only local marker NDBs will be received. Regional NDBs can sometimes be received as far as several hundred miles during the day, depending on the time of year. Night time listening is by far the most fun as NDBs can be received from thousands of miles away. Even 25 watt marker NDBs can be received at great distances when using good equipment and a proper antenna. Since the AR-88LF and the CR-91 are designed for a substantial LF antenna of 200 feet or about 500 to 700 pf of capacitive load, performance in the part of the spectrum will suffer with a small antenna. I use my 135' center-fed tuned dipole with the feed line shorted together and fed to the antenna as an unbalanced load. This could be acting as a 43 foot vertical with a large capacity hat, kind of like the old style "T" antenna. Anyway, it seems to work quite well with the CR-91. A tuned loop antenna will work wonders on a superhet receiver providing lower noise reception and directional characteristics. I highly recommend using earphones for NDB reception. During an evening and a short morning listening sessions this past February (2010) I was able to tune in around 50 or so NDBs with the CR-91. The best DX was YQA 272kc located in Muskoka, ON, Canada, about 2000 miles from Nevada. Best marker beacon DX was SYF 386kc in St. Francis, KS. This was somewhat past the optimum winter conditions of December and January. Next season, I'll be trying the CR-91 on the tunable loop antenna. The advantages of the CR-91 are an accurate tuning dial and plenty of sensitivity. The disadvantages are that all superhets are pretty noisy in the LF/MF part of the spectrum. I was lucky enough to have purchased CR-91 SN 050068 from a surplus store in Reno, Nevada in 2010. I was told about the receiver by a visitor to our museum who had seen it in the surplus store the day before. To my surprise, in Reno the following day, the CR-91 was still there. After a little haggling, I purchased the receiver for $125. It was installed in a rusty Scott SLR cabinet. Though it needed considerable restoration the photo left is the end result. Today, the AR-88 series of receivers have world-wide admiration, not only for their historical significance but also for their tremendous performance capabilities and fabulous audio reproduction. 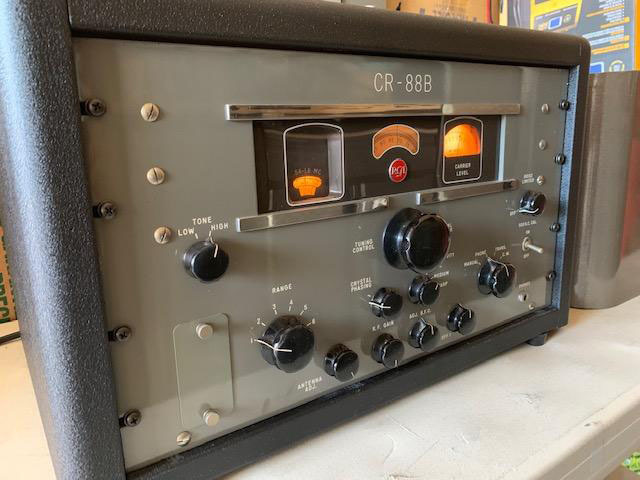 AR-88s and their variants can still be found in AM ham stations where they are providing marvelous audio reproduction of quality AM signals transmitted from classic ham AM transmitters and even from the retired AM BC transmitters that several hams operate today. The AR-88's robust construction, which resulted in a receiver that weighed over 100 pounds in the cabinet, has somewhat curtailed the easy exchange of surviving examples due to expensive shipping rates. However, the AR-88's superior audio, great sensitivity and fabulous "looks" has resulted in many devoted fans from around the world that are willing to pay for shipping or are willing to travel great distances to pick-up one of these incredible receivers. The AR-88 was a milestone classic of radio design and the surviving examples are still reliably reproducing great radio signal audio just as they did sixty-plus years ago. 6. www.jproc.ca/rrp/whitehorse_radops.html - photo of CR-88A and SP-600JX - lots of photos and information on the RCAF Whitehorse Listening Station. Jerry Proc's website is comprehensive on the communications radio history of Canada. An excellent source of information with great original B&W photos.